It’s almost been a whole year since we posted! Yikes, better fix that quick. I was just going back through old posts and found this one about a fun little story Jessica and I wrote progressively back and forth. The link has long since been dead, but I found it at the Internet Archive: Wayback Machine! I’ve copied the text here to live forever. My paragraphs are in italics; Jessica’s are normal. Joe had troubles doing anything. He’d try to ride a bike and would end up falling down. He’d try to kick a soccer ball and would end up falling down. He’d try to fly by jumping off his house and…well, you get the idea. Then one day he met a girl with the same trouble. Cindy could not roller skate without scrapping her knees. She couldn’t braid her hair without getting it tangled in knots. She met Joe the day he tried to fly off of his house. Joe landed on Cindy squishing her flat, but not too flat, as she was able to get up. Cindy said, “Hey, aren’t you Joe, ‘the little boy that couldn’t? '” Joe just hung his head in embarrassment. Feeling awkward, Cindy didn’t know what to say. “…I was just testing my roof’s resiliency,” Joe said, “Everything seems to be in order. What were you doing in front of my door?” Cindy didn’t know how to explain that she had just been getting ready to knock on Joe’s door. “Well,” she started. “I was actually coming over to talk to you about…something. Since I see that your busy, so I’ll just be on my way.” As she turned to run, Joe stopped her. “You know, two negatives equal a positive. I mean, two ‘couldn’t’s would equal a ‘could’, right? So…let’s be friends!” With that, Joe and Cindy were best of friends from that day on and could do anything they wanted as long as they were together. Adam and I recently celebrated our 10th Anniversary. It doesn’t seem like we’ve been married for that long, but we really have. Adam wrote some very sweet things about it on Facebook, and I wanted to put them here too. But first, here is us through the years. We apparently we have to take pictures of ourselves often. So, there are lots of selfies. Here is what Adam had to say about it. I love the way he writes. 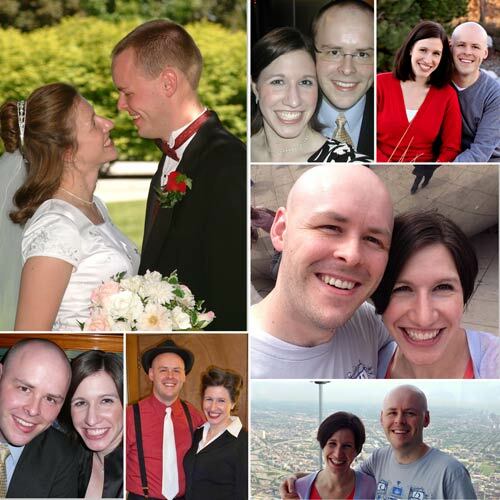 Since I already said the words “Happy Anniversary!” to Jessica on this, our 10th wedding anniversary, I thought I’d instead use this space to tell you about something important to me. It could have been different. We could have never gone on a first date. I asked her out during one of our ward’s trips to the sand dunes. If she had said no, I probably would have given up. I was not (and am not) the persistent type. But she said yes. We could have never started dating exclusively. Even after our first date, I did go on a few other dates before we started “going out”. None of them panned out nearly as well, though. When the time came to make it more serious (as told last fall in one of my status updates), I got up the courage to talk to her about it, but I was very nervous about what would happen and how excited she would be about the idea. If she had said no or been lackluster, I might have given up. But she said yes. We could have never become engaged. I don’t think, after our mostly blissful dating period, that I could have ever NOT asked Jessica to marry me. Still, at times we had our doubts and spoke together about them. They seemed very serious at the time and could have become major stumbling blocks in our relationship. By the time I popped the question, I don’t think there was any possibility she could have said no. We had, time after time, said “yes!” by rejecting those doubts. So, on Valentine’s Day 2004 (I know, I know, Valentine’s Day), she very enthusiastically said yes. We could have never married. Just kidding. When we got engaged and jumped on that marriage-train, there was no stopping it. We went full bore all the way until we both said yes at the altar like it was the most natural thing in the world. Then marriage happened. We could have let it fall apart in a dozen different ways over the past ten years. Compared to some, our tests and trials were probably not huge, but they were to us. Time after time, we were faced with the decision to draw together or pull apart. Perhaps we haven’t been successful 100% of the time, but when the ultimate boiled-down questions became “Are you going to work to make this marriage successful?” we said yes and grew closer together because of it. Today, it seems sort of strange to just celebrate the anniversary of our wedding because, practically, it is such a small part of what our marriage _is_. So, I am celebrating ALL the times we “said yes” and all the ways we are committed to each other. I love you so much, sweetie, and I’m excited to face the rest of our lives hand-in-hand. Hey, Adam here. So, I have Aspergers Syndrome (AS). Just thought I’d get that out there. I was diagnosed last spring, ten months after Spencer was diagnosed with AS. We had not told any people about my diagnosis because it never really felt relevant. Since then, I’ve read a bunch about adults with AS. Research shows that the presence of autism in older generations is roughly equal to kids being born now. That means that the “autism epidemic” you often hear reported is nothing new. We are just better able to recognize it now. It occurred to me a couple days ago that I likely have at least one or two friends with AS/autism and don’t even know it. It has benefited me greatly to understand my place on the spectrum, and I’d like to shine light on it so that if any of those who know me are on the spectrum, some of this might resonate with them. Hence, this post. For a couple years prior to my diagnosis, I had been trying to find an answer to why I had been having difficulties coping with life in general ever since Spencer had been born. I searched and searched all I could trying to figure out why I would have mental breakdowns just because there were dishes to do. Why mentally scheduling a few tasks for a Saturday literally (and I mean that literally) felt as impossible as calculating higher-order derivatives without a pencil and paper. Why more nights than not, I dreaded spending time with my family after work. Why I got moody and grumpy every weekend before church or any social event and felt immense relief whenever such events were over. Eventually, thanks to Spencer’s diagnosis, I was able to match up nearly every single one of my struggles with those typical of someone on the high-functioning end of the autism spectrum. I’d like to go through three specific aspects of how AS has negatively affected my marriage/family life and how learning about AS has shifted it in a positive direction. Wikipedia states that “Emotional intelligence (EI) can be defined as the ability to monitor one’s own and other people’s emotions, to discriminate between different emotions and label them appropriately, and to use emotional information to guide thinking and behavior.” Did you know that there are actual psychological evaluations to assess emotional intelligence? I’ve taken some of them. I didn’t do very well, and it turns out I’m not alone. Many (most) people on the autism spectrum have a hard time with it. For me, specifically, I can label emotions just as well as anyone else in a removed, third-party setting. Unfortunately, in a live setting, I almost completely lack the ability to monitor, discriminate between and label emotions going on in others and especially in myself. I’m sure you can guess as to all sorts of marital hazards that can arise from this. They have taken a few forms for us, but I’d like to share one type. When disagreements have come up for us, emotions tend to accompany them. Well, at least they tend to come from Jessica. I definitely feel them, but I have incredible difficulty expressing or even understanding what they are. On top of that, the emotions Jessica is showing are hitting the impenetrable wall that is my brain. It has led to some difficulties in communication. Pre-AS diagnosis, this would often end with her in tears and me wondering what train of bricks just hit me. I would literally have no clue how to interpret all her emotions as anything more than just “sad” or “mad”. They were like a foreign language to me. One other problem would always accompany such conversations: I would “shut down” in the middle of them. It was never a conscious decision. My emotional center, and also most of my mental faculties, would close for business. I would literally be unable to answer more than yes or no questions. Post-AS diagnosis I have learned that this is a common thing for those on the spectrum. Another term is “overload”. I’ve come to understand that emotions’ (especially negative) affect me in a way very similar to very loud noises. It is much like someone is yelling. And the more the emotion is directed at me, the more deafening. The other night I saw someone crying (happily) and hugging someone else that I knew, and I couldn’t look away. It felt like they were making so much noise and was very, very distracting when it actuality it was very normal for the environment they were in. Learning about AS has helped us understand that I can participate productively in disagreements or conversations-in-conflict as long as we take the right approach. Jessica is allowed to be emotional with me, even negatively, but I might just save my contribution to that conversation until after everything is cooled down. I am not off the hook, emotionally. I have learned that I need to share how I’m feeling with her, with the understanding that it might not be at “normal” times. Jessica’s two cents: Once we started to understand how to better communicate with each other and our reactions to one another, we’ve been better able to avoid any overly emotional crying upset moments on either of our parts. It took some time and a rather steep learning curve, but it has really helped. “Executive functioning” can be simply described as being the CEO brain process that manages and runs all the brain processes that get you through your day. You can read a great write-up of how autism and executive functioning interact here. One of the most common examples of “executive dysfunction” in my life as a parent has been common household chores. If the dishes need to be done (which they MUST be done, a completely different topic), my brain has to plan it out to the nth degree how to accomplish it. I will automatically start virtually loading the dishwasher in my head and plan it all out. If I can’t get them all in, in my head, that brain process shorts out and tries again. This all happens in less than a second and fires off like that over and over and over again. This was all well and good when we were married without kids and had all the time in the world to dedicate to things like dishes and vacuuming. After having kids, that all went out the window. Now, I have no time to spend all my brain power analyzing optimal dishwasher configurations or vacuuming patterns or order of operations in bathroom cleaning or even the best order in which to do all of these things. Now, I have children who constantly want my attention and don’t allow for those important thoughts (please note sarcasm!). Pre-AS diagnosis, I (very stupidly) kept falling into the same trap of letting my mind constantly work on all the problems all at once while juggling kids. It always led to a breakdown (meltdown) of one form or another. Now, post-AS diagnosis, I’ve learned about all this and can deliberately set those processes aside. Yes, I will still have to do the dishes, and you can bet that while doing them I’m still going to be figuring optimal placement (though I’ve learned to distract myself with music or TV so that I don’t burn out my brain). I know now that I have to pick one thing, announce it to the whole family, and do that one thing only. Even if that one thing is “play with the kids”, I can mentally set aside all other tasks. It is admittedly still very difficult, but simply knowing how my brain works is quite enabling. Along with my AS diagnosis, I also received a diagnosis of Social Anxiety Disorder (SA). It does fit quite a bit. The AS part of me has a very hard time understanding social and emotional conventions, and the SA part of me gets very anxious about being conspicuous because of that difficulty. It can be very frustrating some times and a negative loop. It is why I generally prefer to have my social interactions in very small groups. I love game nights at my house because I don’t have to focus on so many people at once. Social language is very much a “noisy” thing to me like emotions. When people exhibit some sort of conspicuous social interaction, it is very distracting to me and hard to ignore. When you get a lot of people doing that all at once, it gets overwhelming very fast. Pre-AS diagnosis, this would result in me shutting down in many social situations. I would be no fun to Jessica because I would be dead weight and possibly ruin what, for her, is something very enjoyable. I also had difficulties transitioning to home life every evening after a socially draining day at work and would not be a pleasant person to be around. Post-AS diagnosis, social situations aren’t necessarily any easier, but I’ve learned some ways/tricks to resetting my brain such that I can “stay in the game”, if you will. Also, I’ve learned that if I just vocalize the stresses from work to Jessica, she can give me space for a while when I need it which goes a long way towards me giving her the one-on-one time that is important for our relationship. Jessica’s two cents: Adam is not the only one who is aware in this situation. I’ve been able to identify some of the things that indicate Adam is approaching overwhelmed before he gets to that point and am able to better help him or even tell him to take a moment to go reset before it becomes an issue. We are not perfect at this, but we are getting better and more understanding of each other’s needs. I don’t mean to paint a bleak picture or anything because, ultimately, I am a very high-functioning person and feel blessed to have always had good supportive friends in my life and to have found so easily my wonderful wife. I know a lot of people on the spectrum suffer so much more, in general. But, if we can improve, any of us, our lives with a little more mental health knowledge about ourselves, it can be incredibly beneficial. 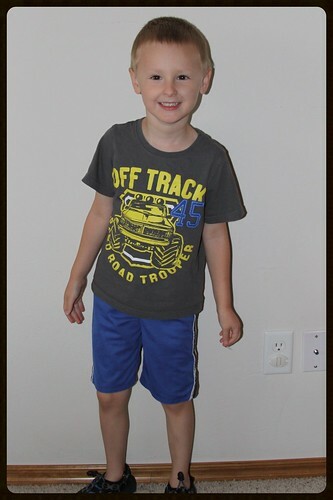 Wow, my Spencer turned 5 last week! 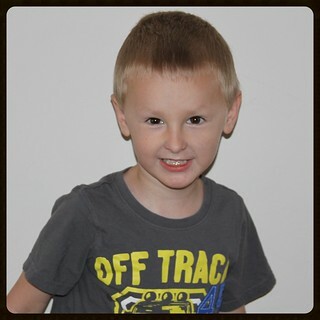 Some days it seems like it’s totally been five years and most days, I can’t believe he’s 5 already. He’s getting SO big and has so much going. We haven’t done our “official” 5 year old photos, but here are some good ones we took on our fall leaf drive. What is your favorite color? Red, and white and pink and purple. Those are the only colors I like. What games do you like? Lego City, Nintendo Land, Twilight Princess and Nintendo Land. Those are all the games. Spencer is the best big brother for Matt. And Matt ABSOLUTELY adores his big brother and tries do do anything that his big brother does. Spencer is very curious about things he loves, and he asks all kinds of questions about them. He has a fantastic imagination, and we often find ourselves telling him he has to turn back into himself before he can go into school, church or some where. He loves watching his dad play Nintendo, and he often has good ideas about how to solve some of the puzzles we encounter in the video games. He is very clever and comes up with some pretty amazing things. We love having Spencer as part of our family and are so grateful for the all the joy and challenges he brings to our family. We would not be the same without him. Happy Birthday Spencer! 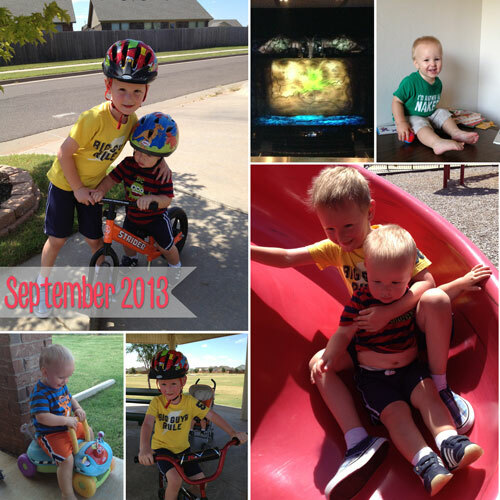 September was a good one for our family. We had lots going on, but we also had a very nice rhythm of our routine of school and the therapies I take Spencer to every week (3 therapists, 4 different appointments). We are loving the predictability of a regular routine, and the lovely fall weather. We have been so blessed in so many ways. Adam and I were able to go see Wicked again. It is such a good show, and we were so glad we were able to see it again. Not much else to say about that, but it’s always worth mentioning. Adam jumped on a planed and headed to Sugar City for a visit. No real reason. He just thought he should go visit, so I made sure he went. When he came home, we were SO glad to have him home. The boys really missed their dad, and I really missed my husband. I started trading boys with my friend (thank you so much!) while Spencer is at school. So Matthew has gotten SO much better about going to other people and being less of a Momma’s boy. We were really concerned about when he goes to nursery in November (oh yes, just 3 more Sundays before Nursery!). We were nervous he wouldn’t be able to be there without me. He’s shown us lately that he’ll be JUST fine. He’s such a laid back guy, and he’s really good about going with the flow. We are so grateful for his attitude. Adam and I spend a lot of time training for our half marathon (running it on October 19th). Our Saturday mornings are spent doing our long runs, which get increasingly longer as the half gets closer. I was supposed to do another sprint triathlon on September 28th, but it was cancelled because of nasty weather. I was a little bit bummed, but it did let me get closer to running the half marathon distance wise before the race. That’s what’s been happening with us for a while. Just in a very deep routine, and we’re loving it. It’s so good for our kids. Starting school is a fun time of year for a lot of kids and families. It’s exciting with all the changes and things happening. They just can’t wait to see who their child’s teacher will be and to send them off to school. Well, that isn’t the case at our house. The start of school means the end of all our summer routines, which brings about a mega case of meltdowns. Throw in the fact that Spencer is going to a big public school (new building), new teachers and new amount of time being in school, and you’ve got the recipe for major pain. To combat that, we tried a few things to help ease the transition from mostly being with Mom all the time (and a very small Pre-school class), and for the most part I think what we did REALLY worked. Starting a week and a half before school started, we went up to the school EVERY day and started working wake up time to school wake up time. The first time we went up to school, we met the secretaries and some of the counselors and learned the procedures for dropping off and picking up Pre-K students. Everyone at our school has been SO accommodating to Spencer and his needs, it’s been wonderful. Anyway, we practiced dropping off and picking up. Then we would also practice walking from the front of the school to Spencer’s classroom (area before we knew which room for sure), from his classroom to the resource room and vice versa, and from his room back to the front of the school. We made sure he knew how to get to the important places he would go during his day at school. When school started, he was VERY confident about where he was going, and I know that eased some of his anxiety about being at school. The only thing we could not simulate was the number of people who would be in the lobby and moving about the school while he was. The large crowds make him very nervous. He’s getting better and better about going where he needs to go everyday though. 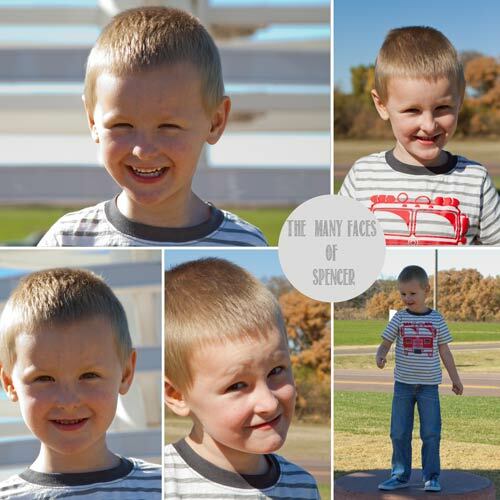 We also created an All About Spencer folder for his Pre-K teacher and his resource teacher. This folder included a letter about Spencer and his diagnosis, and what that really looks like with him. It also included a 4 page Sensory Profile for him. We were hoping these things would give his teachers a head start in dealing with him, and it REALLY has seemed to help. The last two days, his resource teacher has been sick, and has had a sub there for her. Everyday, the sub has been waiting up front to be introduced to him with the para-professional that Spencer already knows, and he has gone with them mostly willingly. I’ve been so impressed by all the faculty and staff at our school, and how willingly and lovingly they have taken my daringly son into the big elementary school. He still has his bad days, but I know it could be SO much worse. Here’s hoping things continue to work well.